For non-residents US$ 1,150 includes non-refundable registration fee of US$ 100 plus taxes; please request pro-forma invoice at checkout. * Foreign students must enter Canada on a visitor's visa. This course is an up-date course for A.G. (C.I.G.) diploma holders and graduates of other schools and institutes. Course Type: Combination of correspondence course and weekend/during week (2 1/2 days) workshop. DIAMOND GRADING certificate after written and practical exam. 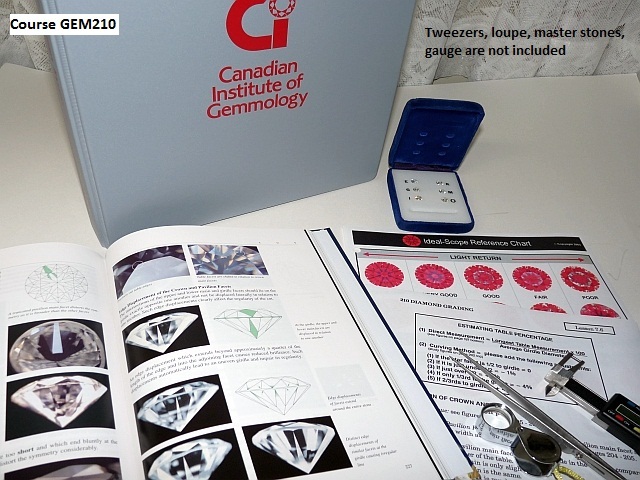 GEM 210 - 6 (practical workshop): Wed - Thur, May 10 - 11, 2017 10.00 a.m. – 5:00 p.m. and Friday, May 12, 10:00 a.m. - 12:30 p.m.
GEM 210 - 5 (practical workshop): Wed - Thur, November 7 - 9, 2016 10:00 a.m. – 5:00 p.m. and Friday, November 11 10:00 a.m. - 12:00 p.m.
To keep costs down no lunch or beverage services are offered, lunch break 12:30 – 1:15 p.m. IMPORTANT: The practical grading workshop must be taken during a C.I.G. scheduled class. Diamonds cannot be mailed out.